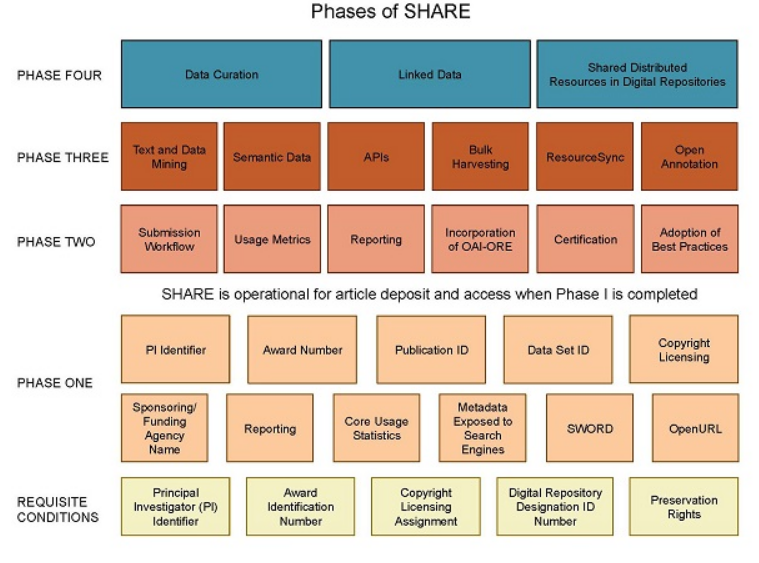 SHared Access Research Ecosystem (SHARE) is a network of cross-institutional digital repositories providing access to and preserving the intellectual assets produced by the academy, in particular those that are made openly available. Research universities are long-lived and are mission-driven to generate, make accessible, and preserve over time new knowledge, in order to foster innovation in communication, exploration and discovery, and meta-scholarship. “Against the backdrop of global efforts in building scientific data infrastructure (e.g. Research Data Alliance) and national initiative in developing SHared Access Research Ecosystem (SHARE), data sharing and open access movements are quickly gaining momentum in academic communities” (Strategic planning for a data-driven, shared-access research enterprise). initiative was launched by the Association of Research Libraries (ARL) and the Center for Open Science (COS) with the support of the Association of American Universities (AAU) and the Association of Public and Land-grant Universities (APLU) in 2013, to maximize research impact by making research widely accessible, discoverable, and reusable. about research and scholarly activities across their life cycle, and share it through a network of cross-institutional digital repositories. SHARE is funded by the Institute of Museum and Library Services and the Alfred P. Sloan Foundation, and is built with Open Technology. SHARE’s workflow is fully automated and all its phases connect with and take advantage of the Digital Preservation Network (DPN). and exposing that metadata to search engines (e.g., Google, Google Scholar, Yahoo, Bing, etc.) and other discovery tools, SHARE creates a federated, consensus-based system of existing university-based digital repositories, thus obviating the need for a central digital repository and leveraging the considerable investments already made by universities and their libraries over the last decade. 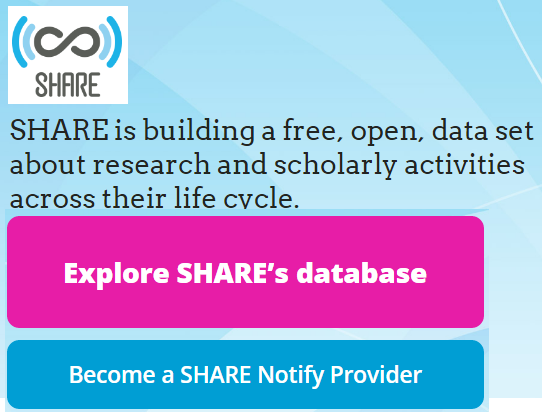 SHARE is also engaging the community to contribute authoritative metadata enhancements and to develop software code to help users get the most out of SHARE’s free and open data set. In order to ensure interoperability wherever it is practical, SHARE is in contact with a wide range of international organizations, including the Confederation of Open Access Repositories (COAR), JISC, and OpenAIRE. is SHARE’s first project which notifies interested stakeholders (such as funding agencies, sponsored research offices, institutional and disciplinary repositories) when research release events occur, including the publication of articles and the dissemination of research data. Notifications are distributed in a normalized way, i.e. in the form of a concise set of metadata (fields might include author information, grant number, DOI/s, and agency ID/s). SHARE Notify relies on existing standards (e.g., the ORCID researcher identification scheme, the Open Funder Registry taxonomy of funder names) where available. SHARE Notify makes use of the Open Science Framework (OSF) which is a Center for Open Science (COS)’s free, open-source platform designed to connect the scholarly workflow. OSF includes an open API so that the entire corpus of research release event data can be freely mined. As of March 2016, SHARE Notify public beta includes metadata from more than 100 content providers, such as Biodiversity Heritage Library OAI Repository, BioMed Central, PubMed Central, and other subject and institutional repositories around the world. Use data from the SHARE JSON API to build your own application. Technical documentation of the evolving SHARE Notify - including an FAQ - can be found on the SHARE project on the OSF. A list of terms used by the SHARE development community can be found on the Open Science Framework SHARE wiki. If you are a stakeholder in the research ecosystem - a researcher, librarian, funding agency officer, university administrator, repository manager, publisher, or other involved party - interested in being a part of SHARE, please contact SHARE directly. Moreover, SHARE invites you to use this two-page flyer (SHARE Flyer (color PDF); SHARE Flyer (black & white PDF)) to spread the word about SHARE and to let SHARE know what kind of feedback you get.